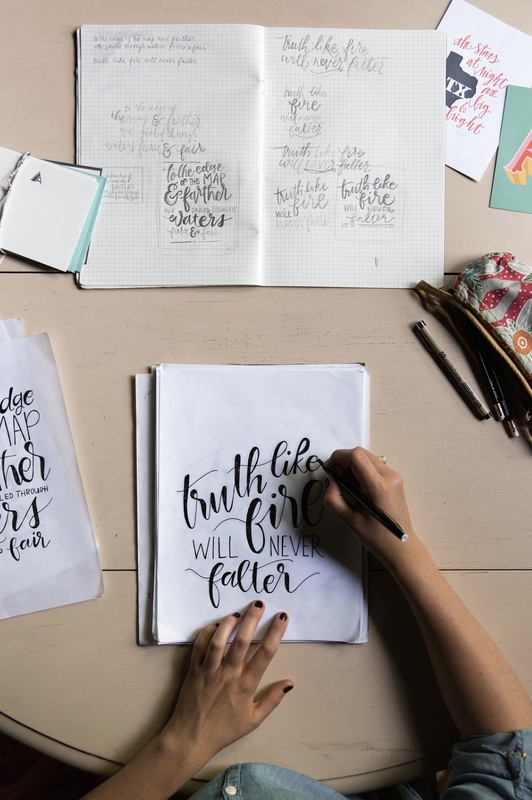 An interview with artist and calligrapher Andi Mints, who is creating one-of-kind work that compels a second look. Tell us a bit about your background. What inspired you to become a designer? Growing up, I loved to make things, whether that was doodling flowers, building little houses, or constructing various things out of leaves and twigs. But, the idea of “making things for a living” wasn’t ever talked about at home. While part of my family tree was populated with artists—oil painters, specifically—creating was limited to a hobby my lady ancestors pursued in their downtime. Making was in my bones, but it had never occurred to me that I could fill my days with making and somehow manage to make a living out of it. After high school, I went down the traditional university route, only to find myself uninspired—at least, until I learned about portfolio schools more than two years into my degree. I knew that this was the best way to right my course, so off I went to the Creative Circus, in Atlanta, for the two most fruitful years of my education. I made a lot of things, experienced both successes and failures, and most importantly, learned what it means to be a vocational designer. Being a designer is about solving problems, essentially. The design of a thing is two-fold: how the thing works and what it looks like. This philosophy extensively shapes my day job, where I get to influence and design a brand with a really great group of really talented people. Also integral to my personal design philosophy is the idea that design is composed of countless, tiny details—details that may be lost to most people, but that to me constitute the most important elements of the design. The many working together to make a whole: that’s where my love for design in general, and for hand-drawn type in particular, lives. Explain your studio practice. How do you go about designing? Where do you find your inspiration? I create lots of different things, and my studio practice looks differently depending on the media and modes I’m working with and in. The short answer? I always begin by taking the present design problem and assessing it: finding out what’s really going on and beginning to tease out where the solutions are. Then, it’s on to a process of vision, planning, drafting, feedback, and revision. Eventually, I arrive at something that (hopefully) works to make the world a teeny bit better. When I’m working with hand-drawn type, specifically, I need to learn what the letters are going to do with each other, and a lot of my studio practice goes into that investigation. Some letters play nice with their neighbors, while some take a little more convincing. No matter the style, the only way to find out the letters’ particular vibe is to draw them out together many, many times—over and over again until they begin to harmonize into one cohesive form. There’s that idea again: the many working together to make a whole. I draw inspiration from many sources, including bodies of works that are like mine, and others that are very different from mine. I follow a variety of letterers, designers, typographers, photographers, clothing makers, interior designers, and painters, because I’ve found that if I’m just in my head all the time, I’ll only make the same kind of work over and over again. And that’s boring. Seeing others’ work motivates me to challenge my own style and to constantly refine it. Tell us about your knack for typography. In the third grade, I won Best Handwriting in Mrs. Spencer’s class, and I guess you could say that it went to my head. Even at eight years old, I had an obsession with seeing graphite glow from a pencil tip and onto a page to form lovely D’Nealian curves or cursive connections, and I would trace the same letters over and over again until my dull pencil burst through the page. Now I still use just a pencil and paper to start. I feel like my eight year-old self is paid some sort of homage in that. I love letters. I lose my mind over the lovely ones I discover out in the world. I especially love the way letters interact with other letters. It's like a dance. Often, when I’m studying a lettered piece by another type designer or calligrapher, the piece is, for me, less about what the words say and more about the forms the letters make. The clever subtle details of these letters tell stories of the designer who made them. In the age of computers and make-your-own fonts, I relish the delicious rarity of a hand-drawn letter. What advice would you have for readers interested in pursuing a creative business? Make things that make you come alive. Find that thing that gives you a total rush, that you could talk about for days on end, that makes other people call you a nerd because you love it so much. Find that thing and do it—do it until the cows come home. It may be a while before it’s a monetarily fruitful gig, and truthfully, it might never be. But if you’re shining as a person because of the work you’re doing, that will bring peace and joy and light into the space around you. Others will be blessed by that. What is your favorite pass time (besides designing)? I love being outdoors. Even in something as simple as a walk around my neighborhood, I find such a recharge from being in the sunshine, being around plants, and moving my limbs. Being outdoors is only made better by being outdoors with my favorite people. To learn more about Andi and her work, visit her website, here.